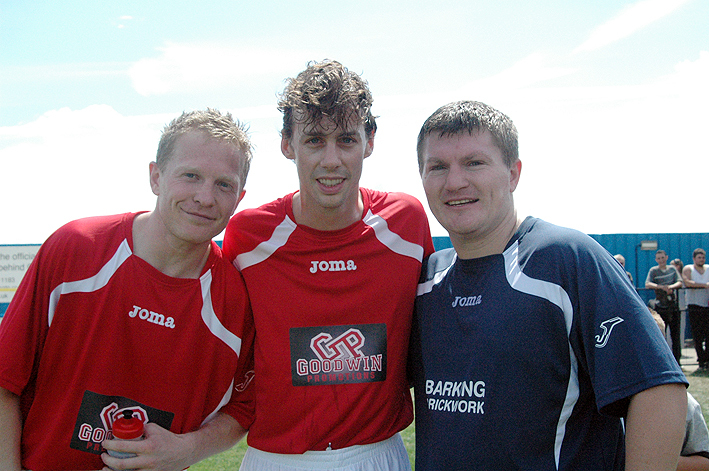 The Johnny Eames and Derek Grainger, from the Ultrachem TKO Gym in Canning Town, organised Boxer & Celebrity Football Tournament proved to be a massive success. The stars turned out in force, as did the paying public to watch the ten teams battle it out for the Ultrachem TKO Indee Rose Trophy. 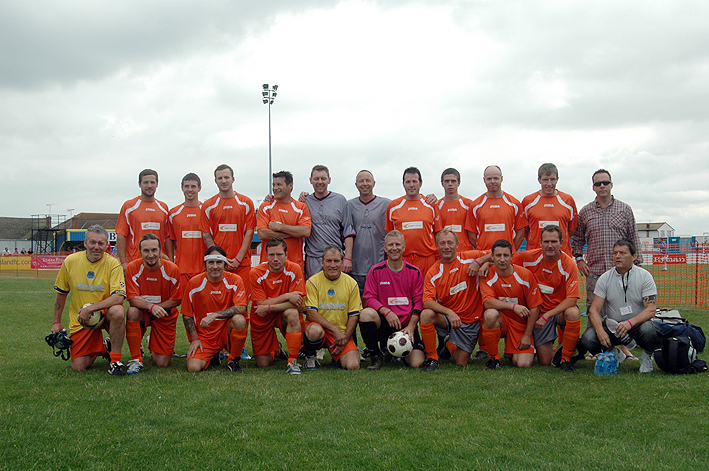 Almost 200 celebrities, from Boxing, Football, Music, Film, TV and the National Press, made the trip to Canvey Island, Essex to take part in the event, which raised in excess of £20,000 for the Indee Rose Trust. The day started off with with the draw, which saw League One made up of Ultrachem TKO Clapton Rangers, Iron Maiden, Paul Smith’s Pickpockets, Graham Earl’s House of Champions and Willie Limond’s Bravehearts. Whilst League Two consisted of Ultrachem TKO Gym, Jimmy Mac’s Mashers, Steve Lillis’ Reporters, Team Alio and the Ultrachem TKO Indee Rose team. League One: On paper Ultrachem TKO Clapton Rangers were favourites, having been hastily put together by Johnny Eames’ former pro footballer son Ritchie following Gavin Reece’s Welsh Wizards withdrawing just days before the tournament. Ritchie, who as a youth played for West Ham, Tottenham Hotspurs and Barnet, hit the phones and put together a team littered with former pros. They looked set to steam roll their way into the final following an impressive 3-1 win over Iron Maiden followed by a win over Willie Limond’s Bravehearts. 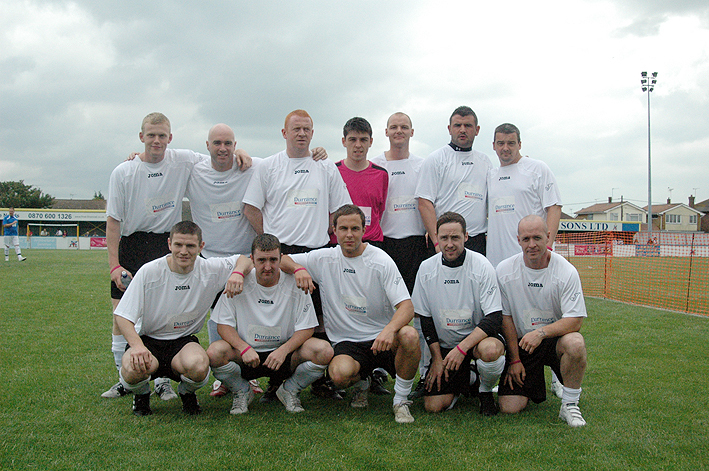 Their next opponents were Paul Smith’s Pickpockets, who had beaten Graham Earl’s House of Champions 1-0. Much to everyone’s surprise the boxing scousers dominated the game ending up 2-0 victors. The scouse juggernaut rolled right through Willie Limond’s Bravehearts and then fought out a wild final group match against Iron Maiden. This was without doubt the game of League Two. It was tight and competitive. Iron Maiden took the lead twice, each time the fiercely competitive ‘Pickpockets’ fought hard to even the score within minutes. With the game deadlocked at two a piece and just three minutes left on the clock Paul Smith lead a storming charge which ended with a the ball rocketing into the Iron Maidens net. It was then all hands on deck, for the scousers, to repel the constant barrage of shots from the orange army of Iron Maiden. 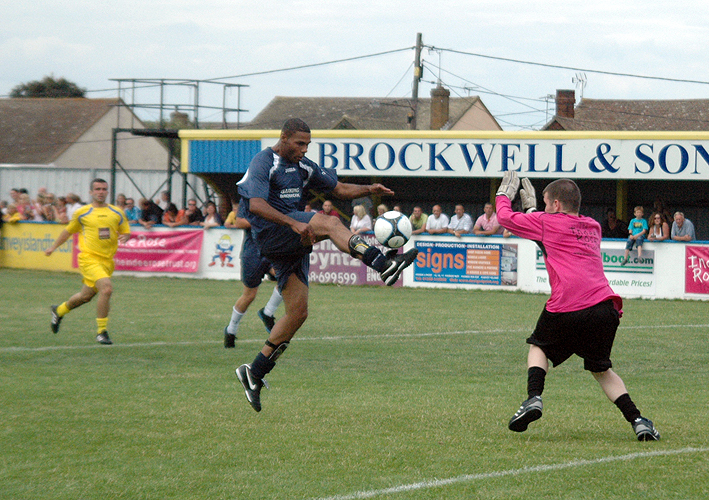 The 3-2 victory over Iron Maiden firmly secured a spot in the final for Paul Smith’s Pickpockets. League Two: There was no clear favourite for the second group before the matches started. Once they got underway both the Ultrachem TKO Gym and Ultrachem TKO Indee Rose Trust teams and Team Alio showed that they had what it takes to go all the way. Alan Wilton’s Team Alio were the first to lose their unbeaten status following a tight game against the Ultrachem TKO Gym team. Team Alio were unfortunate to concede a late goal from on-form striker, Commonwealth Middleweight Champion, Wayne Elcock. League Two suddenly became a two horse race with Ultrachem TKO Indee Rose Trust continuing their unbeaten run with a convincing 2-0 victory over Steve Lillis team of Journos. Steve’s attempt to add some striking power to his ailing team, which had yet to score a single goal, by poaching David Haye’s manager/coach from the Ultrachem TKO Gym team had failed. They had one game still to play but as that was against Jimmy Mac’s Mashers the chances of them not picking up the event’s wooden spoon looked seriously slim. The Ultrachem TKO Indee Rose Trust Team went on to beat Team Alio 2-1 in a highly competitive game that saw the only penalty of the competition being awarded. Luckily for the Ultrachem TKO Gym Indee Rose Team they had the excellent Ali Adams in goal. Their next game, against the also unbeaten Ultrachem TKO Gym team, would decide who would face Paul Smith’s Pickpockets. Once again Wayne Elcock again proved to be the decisive element. His single goal securing the victory, and a place in the final, for the Ultrachem TKO Gym team. 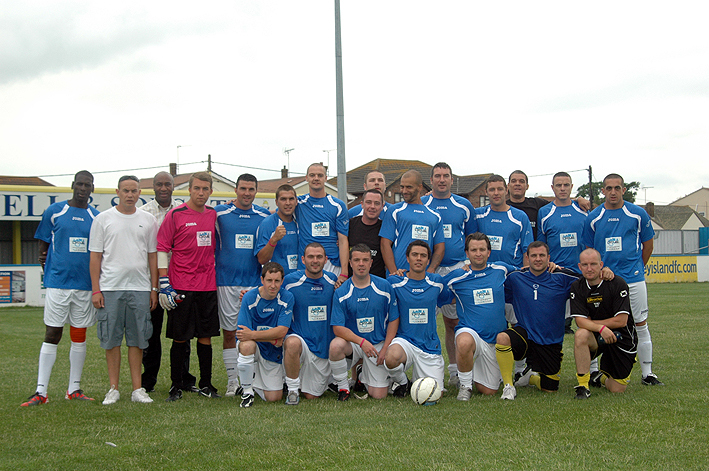 The final League Two game, between Team Alio and Jimmy Mac’s Mashers, produced the goal of the tournament. With just minutes to go ‘til the final whistle Rock superstar Johnny Borrell put through a superb ball to Light Welterweight Ben ‘The Entertainer’ Day. Ben, who was primed for a professional football career before discovering his love of boxing, took the beautifully weighted cross in his stride to volley the ball into the top corner of the net to secure the win. Prior to the final event MC Bob Williams turned auctioneer for the fabulous array of donated boxing memorabilia. Bob, who had stopped in at the last minute, received a lot of praise from the organisers for his commentating skills. During the group stages Bob had managed to keep the crowd fully informed by giving a running commentary on two games simultaneously! 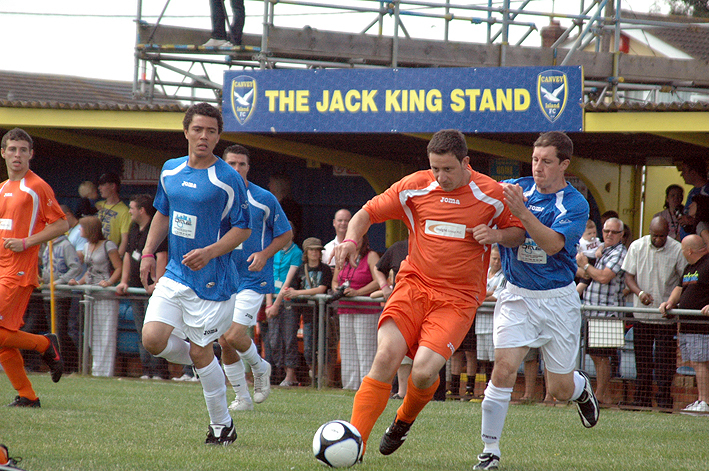 The Final: The format of the final was changed to teams being eleven a side and played on the full pitch. 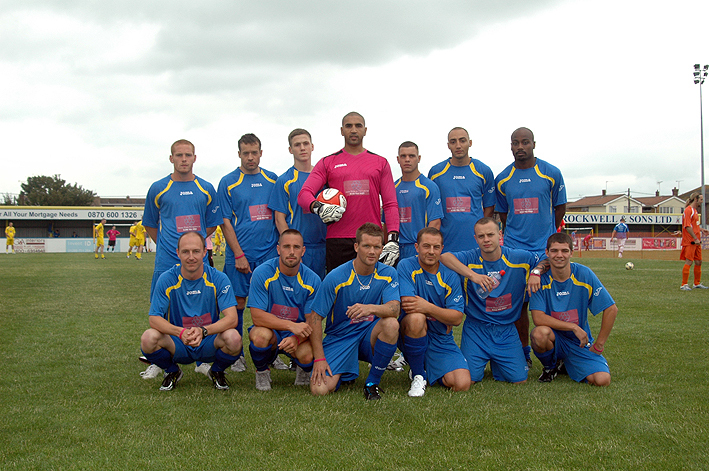 Paul Smith’s Pickpockets ready to take on the might of the Ultrachem TKO Gym and their super striker Wayne Elcock. Paul lead his team out on to the pitch first. Moments later the crowd roared as WBA Heavyweight Champion David ‘Hayemaker’ Haye lead out the star studded Ultrachem TKO Gym team. Just prior to the kickoff Paul Smith, who had generously offered to host next years event in Liverpool, said “We’re gonna win it. My team’s proved they can win this. There’s a few tasty boxers on their side, so we don’t want to see any heavy tackles going in. It’s been a great day, it’s been fun and hopefully we’ve raised a lot of money for a very, very good cause. With fighting talk out of the way the two teams lined up. 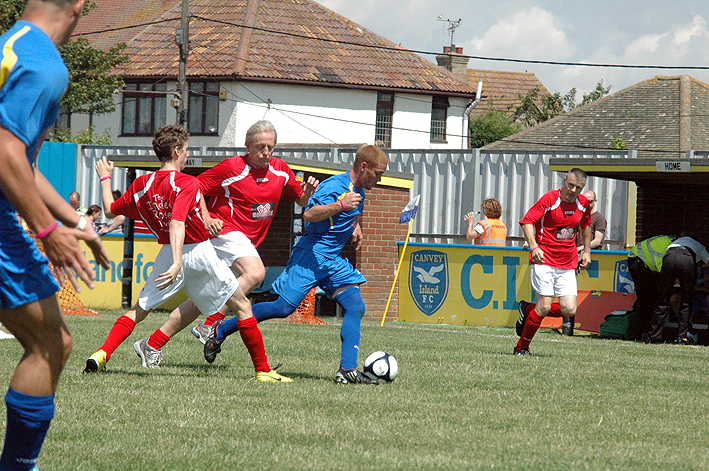 The Merseysiders dominated the early proceedings, keeping the ball in their opponents half for extended periods. The game suddenly turned, following a determined tackle by Georgie Hillyard, which lead to a flurry of heavy tackles from both sides before the ref regained his authority. 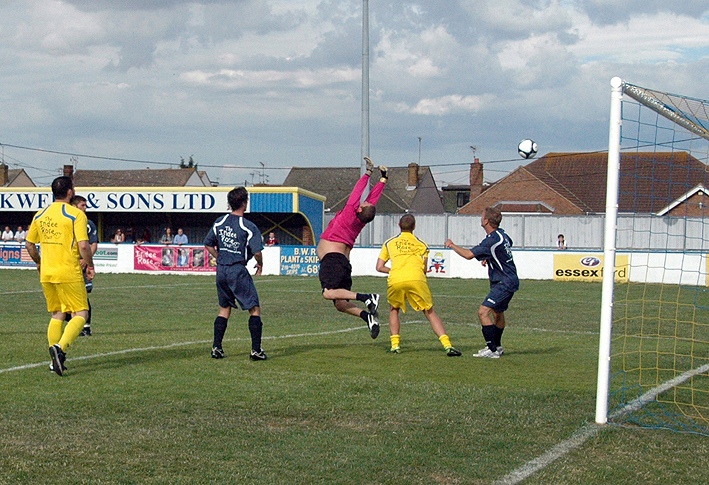 Moments later a beautiful searching ball found Paul Smith with some space and just the goalkeeper in his way. In a flash Paul punished his hosts with a beautifully taken goal. Just a few minutes later, following a free kick, the ball again found it’s way into the Ultrachem TKO Gym goal, only to be disallowed due to a blatant push on the already leaping goalkeeper. The second half started off more or less the same as the first, albeit with the Ultrachem TKO Gym team being the dominating force. Super striker Wayne Elcock, who was clearly intent on keeping his record of scoring in every game, worked his socks off. Shooting at every opportunity only to see his efforts thwarted by some excellent goalkeeping. Few chances came after this for either team and the game ended with the single goal, in favour of Paul Smith’s Pickpockets, being the difference between the teams. On receiving the Ultrachem TKO Gym Indee Rose Trust Trophy Smithy said, “We only went and won it didn’t we. I said along we’d win it. Johnny’ll have to come up to us now to try and take our trophy off us. It was a great day, brilliantly organised, good turn out. It was great to be part of it. Goal of the tournament – Ben ‘The Entertainer’ Day from Jimmy Mac’s Mashers for his premiership quality goal. Golden Boot – Wayne Elcock who not only scored all the Ultrachem TKO goals – but scored nearly twice as many as his nearest opposition! Star of the day – RICKY HATTON – who not only played every game for the Ultrachem TKO GYM team, but when not playing spent his time signing autographs and being photographed with someone or another. 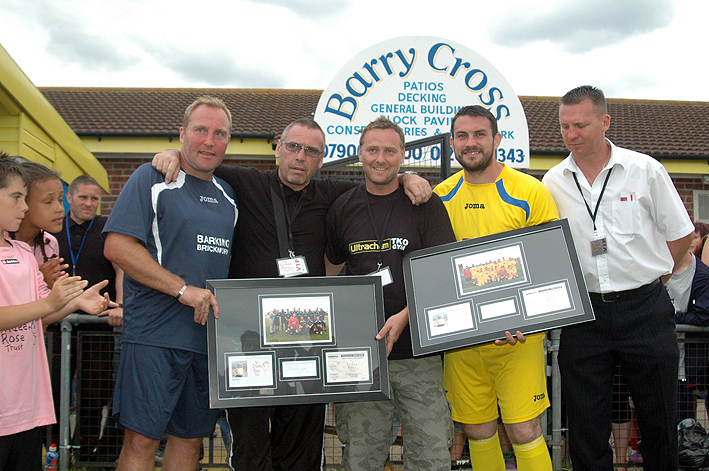 Ricky also supplied top class memorabilia for the charity auction. Ross Minter, Kevin Mitchell, Wayne Elcock, Graham Earl, Tony Oakey, Paul Smith, Billy Joe Saunders, Johnny Borrell, Steve Harris, Mark Wingett, Paul Smith and many many more of the celebrities, weren’t far behind Ricky for this accolade, they also spent much of their free time signing autographs and being photographed with members of the public. Steve Lillis and his National Journalist Team pick up the wooden spoon having not won a game or score a single goal! Final word on the day has to go to co-organiser Johnny Eames, of the Ultrachem TKO Gym, who said,”First of all I want to say a big thank you to all concerned, Ricky Hatton, David Haye, Paul Smith, Alio, Graham Earl, Willie Limond, Jimmy Mac and obviously my own team from the gym, and an absolute big thank you to a rock legend Iron Maiden’s Steve Harris, who flew all the way in from America on the day. Landed on the day and came and played four games, he got beaten in two but did play really, really well, gave four excellent games and stayed after signing autographs. Absolutely a rock legend giving up his time and coming and play for a charity he knows very little about. That’s just amazing, just shows you what great people there are about. I’m so pleased for Russell and Jane, they’re the parents of young Indee. None of us could bear thinking about the time they must have had and what they had to endure to get through the situation they found themselves in. It must have been unbearable, but listen you’re doing a great job to help other children and families who find themselves in the same situation you were in. As I said before Ultrachem TKO will be there for you running a similar event for you. Hopefully bigger next year if we can find a big backer. I’m sure there are potential backers out there who have seen what the boxing world can do and hope that they’ll come along and sponsor next years event. Paul Smith’s boys are going to put it on in Liverpool next year. It should be a great day as I know Paul and the boys will do us proud. I forgot about the news reporters, how can I forget them, they came with the worse team. They showed they were the worse team, they played four, lost four and scored none with eight against, but that doesn’t mean a thing as they’re great sportsmen. You write a good sports article and you’re good sportsmen. Love everyone of you. See ya all next year. 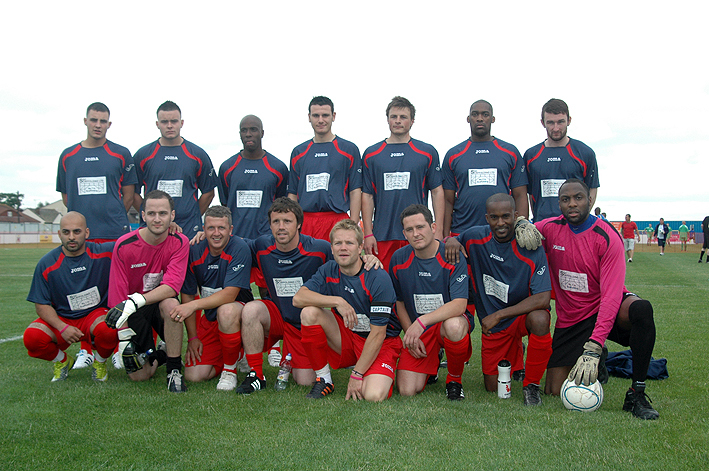 I just want to run through those that paid a £500 donation, to the charity, to have their name on the team shirts. They had the company elements on the front of the kits. We’ll start off with a big thank you to SGS Scaffolding, Steve Goodwin’s Promotions, Durrance & Co ltd, who is one of my fighters, Matthew Marsh’s, personal sponsor. Barking Brickwork, Ricky Mann’s Waste, Ricky Mann’s a good friend of mine. Insight Group Plc, that’s the Iron Maiden themselves, who as I said I couldn’t thank them enough. Docklands Marquees, Richard Mason fantastic guy who also supplied some of the marquees on the day. Nuttels, who are Derek Grainger’s friends. Thank you very much to yourselves. Get solutions, I don’t know who they are but thank you for your great sponsorship. Finally big thanks to Becky at Thorough Breads. You did us proud. Thank you all.